Posted by Mark Tuttle on May 24, 2014. Can you see the smile on my face? Can you see the joy shooting out of my ears like fireworks off a bridge? 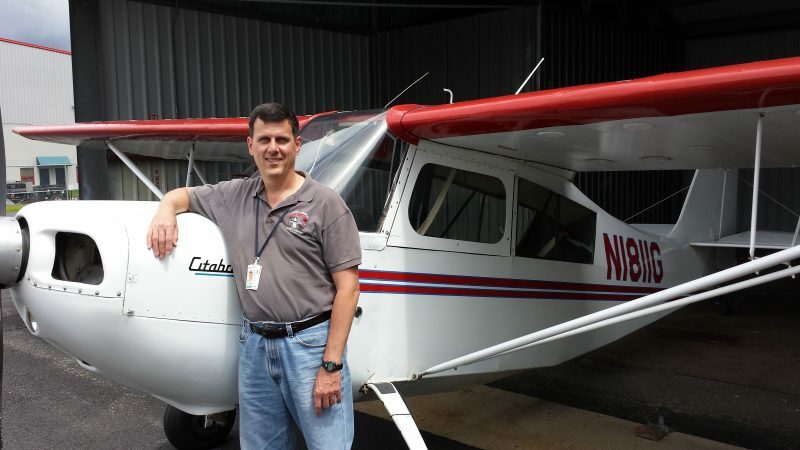 Waiting for our club Cherokee to get out of the shop, I started tail wheel instruction in a Citabria with Chris Dupin at East Coast Aero Club in Bedford. The weather was great, the plane was great, the instructor was great, everything was great. We went to a quiet ramp to practice ground maneuvers for taxiing, then took off and flew along the north edge of Route 128 under the Boston airspace to practice steep turns, slow flight, stalls, and slips. Baby. A Citabria knows how to slip. We practiced take offs and landings at Beverly. Following along on the controls as my instructor took off… Wow. What a thrill. Where I had been punching the rudder pedals with my feet to keep the plane rolling down the runway center line, this man was just tap dancing on the pedals like gentleman in a top hat and tails. To feel the plane come alive in your hands as the controls become responsive as the plane picks up speed, like a balloon expanding and finally lifting itself erect. That is the bond with the machine that I seek. I love our Cherokee, our plane that has been so reliable and so constant, but I think I’ll just duck over here while no one is looking and have a little fling with a Citabria. That’s the great thing about flying with a club like ours: everyone has a story, everyone has an experience, everyone has fun, and every now and then you get to hang out with your friends and hear about it.